ANCHORS AWEIGH! : Swavek Locke, center, better known by his first name only, was guest of honor last Friday when IN Magazine celebrated his birthday with a small party aboard the Vida-Mia in Kewalo Basin. IN Magazine founder/publisher Emily Lopez, fourth from left, organized the event for Locke, a contributing writer to the magazine. Ed Wayne, Rachelle Hyde and Madeleine Noa were among the guests who arrived fashionably on time to board the vintage yacht and enjoy a post-sunset cruise watching the fireworks off Waikiki. COFFEE ANYONE? : Manuel Wisotzky and his wife, Kei, helped give the party its international ambiance. 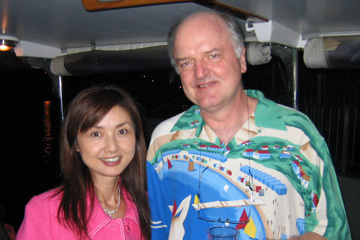 Wisotzky, a native-born German despite his Polish surname, spent almost 20 years in Japan, and is fluent in Japanese, English and several other languages. Wisotzky is overseeing completion of Hawaii's first Euro Cafe. The cafe will feature fresh-ground luxury-grade coffee when it opens next month in Waikiki. NO, HE'S NOT PIPI: Swavek's party wasn't the first time someone saw John Garcia and mistook him for Pipi, long-time member of the morning show at KCCN/FM100, and they're not even related. 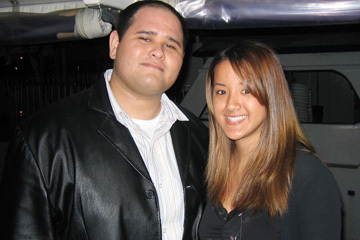 Garcia enjoyed the cruise with Melanie Wong. SHARING IS GOOD: Rory Rankin and Rita Gray shared a comfortable couch with Alisa Woo after the Vida-Mia left harbor en route to Waikiki. Woo, originally from Korea, shared a fascinating story of her experiences coming to the United States, learning English and graduating from college. CAN'T STOP THE PARTY NOW: Shannon Kaahanui, left, A.J. Martinez and Jamaica Bradley weren't ready to go home when the Vida-Mia returned to Kewalo. All the men on the vessel received Pommery champagne in blue bottles. The ladies' bottles were pink.